When I was a kid we used to drive up on the Blue Ridge parkway to a little picnic spot with my grandparents. On the drive home, we'd often stop at the Bent Mountain farm stand. They've been there since 1981. They always had the best peaches. The type bursting with flavor and juice. We aren't over that direction very often, but a couple of weeks ago we were driving by it. I stopped. They had peaches. Perfect peaches. It's so perfect it doesn't even look real. Peaches are my favorite fruit, and I was giddy when I smelled this one. The fuzz was so fine you could barely even see it. And they flavor? Just as perfect as the appearance! Readers, what is your favorite fruit? Our cold spring killed most of the peaches in this area, they will be coming from the south this year! zwarte bessen . ze zijn haast niet meer te krijgen maar als je daar sap van maakt. fantastisch een godendrank. My mouth is watering just looking at that peach! I thought it was a nectarine at first--soooo smooth looking! I love fresh peaches cut up with just a little sugar. That sure is a good looking peach. I think I prefer apples above all but I like peaches too!!! Peaches are my favorite but only fresh ones, can't stand the hard picked-green things at the store. I have peach trees but haven't had a peach in years as when they don't freeze, the stink bug plague attacks them. They must use some strong poison to keep the bugs away. It does look perfect. i'd love to see the follow up photo with a big bite missing! It IS perfect and beautiful! We go to Chiles Peach Orchard in Greenville. They are huge, and also have a vegetable garden and flower garden, all for picking. They have a pumpkin patch in the fall, and activities for kids. And in the spring when the trees bloom, all the mountains are pink! Phil worked in a peach orchard as a kid for his grandfather, so he is really picky about his peaches. He said he would come home and his skin would be covered in fuzz. I think he would approve of this one. YUM! nothing like a perfect peach. Nothing worse than a woody one. blech! Oh wow...that looks delicious!!! 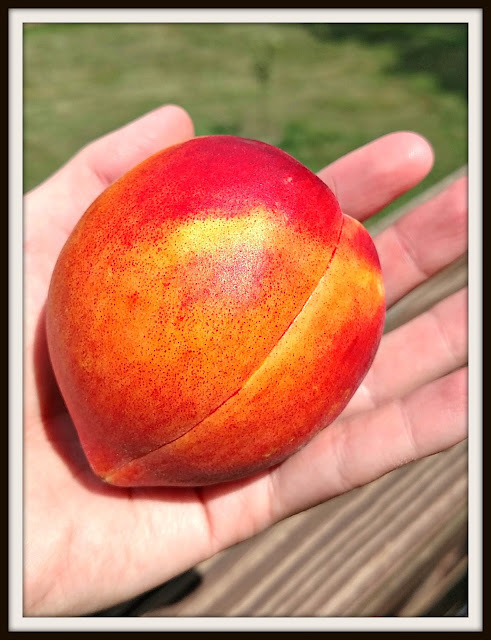 I enjoy just about any fruit, but fresh peaches, fresh mango, fresh anything! oh my... that is a perfect peach!! Looks so yummy! Something that we can't find here.